Instagram is the place to show off with pictures of things your mates will envy and strangers will covet. Competitiveness is deeply ingrained, which makes it the perfect place for gamers to share the things you love for bragging rights, and see what others have been doing to inspire you to even greater feats. 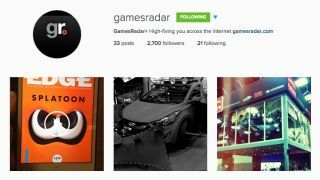 So check out our selection of the best gaming accounts on Instagram: some are funny, some make you want to buy things, some will have you wanting to join in and send your pics to, and some will show the behind-the-scenes delight of working in the games industry. And don't forget to follow us on Instagram too! Lovers of all things Destiny will appreciate the gorgeous pics, armour shots and short videos the game provides. Action shots from the top-selling game. Fans of the Fallout series will find everything Fallout here - similar to the Bethesda page but focusing on just the one franchise. The hugely popular football title has its own Instagram, with formation pics and behind the scenes shots. The gaming studio responsible for the Fallout series of games, has posted some gorgeous art from the series as well as cool coverage of their conferences, and convention attendances. This is for you if you especially love the Wasteland. Everything Sega, but mostly Sonic. They even instagram-ed them getting a mention on Jeopardy! The console offering from Microsoft has some really beautiful gaming pics, and several shots of controllers placing the gamer at the centre of its images. Nintendo has a seriously cute Instagram page. Amiibo, your favourite games characters and great fan art make this a great follow. The VR headset has a growing page – get all the latest news on the hardware here. Their chips are in a lot of rigs. Check in for pics from their trade shows as well as the latest internal bling for your gaming PC. The chip giant has many many cool images of elite gaming rigs, which is a bit hashtag-tastic but there's plenty here for gaming and hardware-heads alike. More graphics cards and cool LED setups than you can shake a stick at here. There's some very shiny tech here, powered by the graphics chip. Events coverage and crazy videos fill up this gaming Instagram nicely. Gaming gear a-go-go, cosplayers, events and cool stuff in this games accessories Instagram. From Notch, the creator of Minecraft, this Instagram account is an insight into the kind of life a successful games creator can have. Somewhere between gaming, film and geekery, this Instagram account offers up pretty funny skits on popular sci-fi nerdist culture. An Instagram game in itself, the creators of Rickstaverse have managed to gamify Instagram, with a link-click based story game. A pretty awesome Instagram for those with gaming-related tattoos.